11 जुलाई 2011 को नेप्च्यून ने 1846 में इसकी खोज के बाद से अपनी पहली द्रव्यकेंद्रीयEn परिक्रमा पूरी की, हालांकि यह हमारे आसमान में अपनी सटीक खोज स्थिति में नहीं दिखा था, क्योंकि पृथ्वी अपनी 365.25 दिवसीय परिक्रमा में एक भिन्न स्थान में थी। Because of the motion of the Sun in relation to the barycentre of the Solar System, on 11 जुलाई Neptune was also not at its exact discovery position in relation to the Sun; if the more common heliocentric coordinate system is used, the discovery longitude was reached on 12 जुलाई 2011. ↑ Yeomans, Donald K. "HORIZONS Web-Interface for Neptune Barycenter (Major Body=8)". JPL Horizons On-Line Ephemeris System. अभिगमन तिथि 8 अगस्त 2007. At the site, go to the "web interface" then select "Ephemeris Type: Elements", "Target Body: Neptune Barycenter" and "Center: Sun". ↑ Seligman, Courtney. "Rotation Period and Day Length". अभिगमन तिथि 13 अगस्त 2009. ↑ अ आ इ ई उ ऊ ए ऐ ओ औ क ख ग घ ङ Williams, David R. (1 सितंबर 2004). 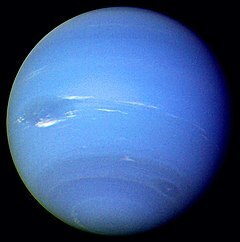 "Neptune Fact Sheet". NASA. अभिगमन तिथि 14 अगस्त 2007. ↑ Anonymous (16 नवम्बर 2007). 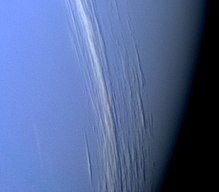 "Horizons Output for Neptune 2010–2011". अभिगमन तिथि 25 फ़रवरी 2008. —Numbers generated using the Solar System Dynamics Group, Horizons On-Line Ephemeris System.